I know I haven’t posted for a while, but I promise my life hasn’t ground to a halt! I just need to get back into the habit of blogging a bit more regularly. So I thought to ease myself back into it that I would do a nice easy post about some of the baking I’ve been getting up to, both because it’s something that I really enjoy, and also so I can tempt you with pictures of cake! 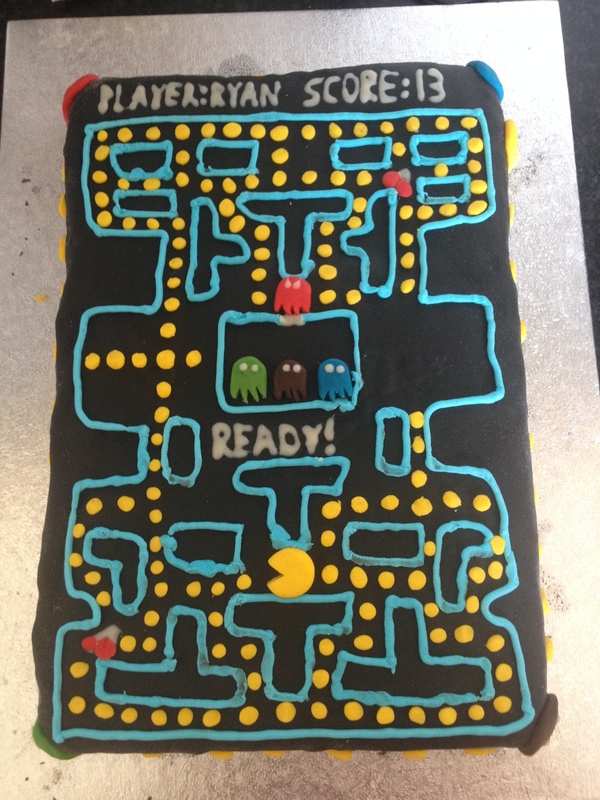 At the end of August/start of September the kids all had their birthdays, which is my more inventive baking time. This year I was slightly sneaky and stole some ideas off Pinterest, although in my defence, it was just pictures, I had to work out the rest for myself. Katy-Grace and Sam had a birthday party this year at the LC in Swansea- so basically a pool party. 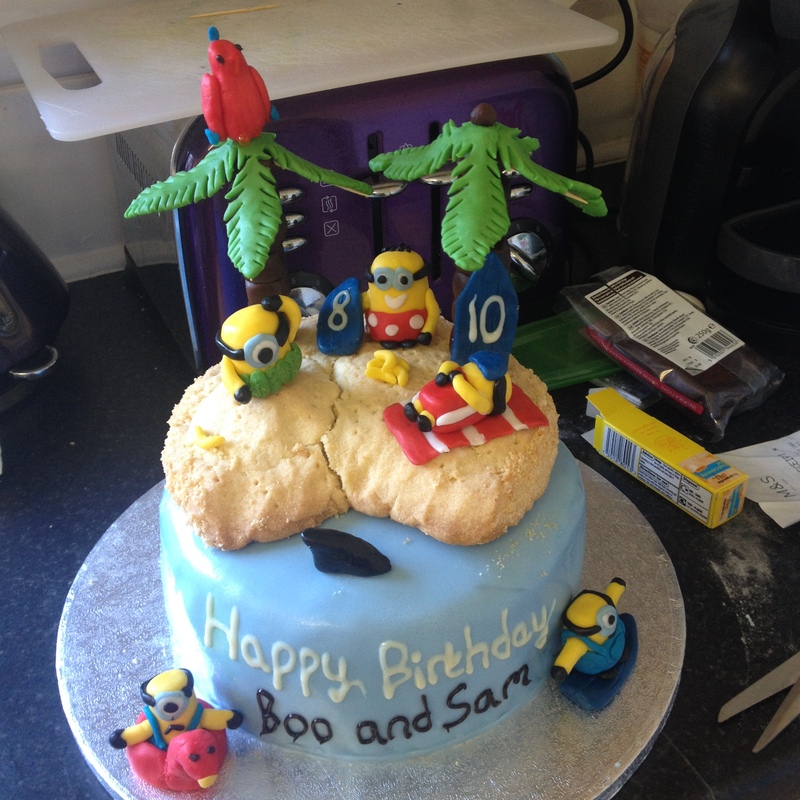 So I decided to make a minion pool party cake for them to fit in with that, based on the bit in the second Despicable Me film where all the kidnapped minions are enjoying themselves on the beach. 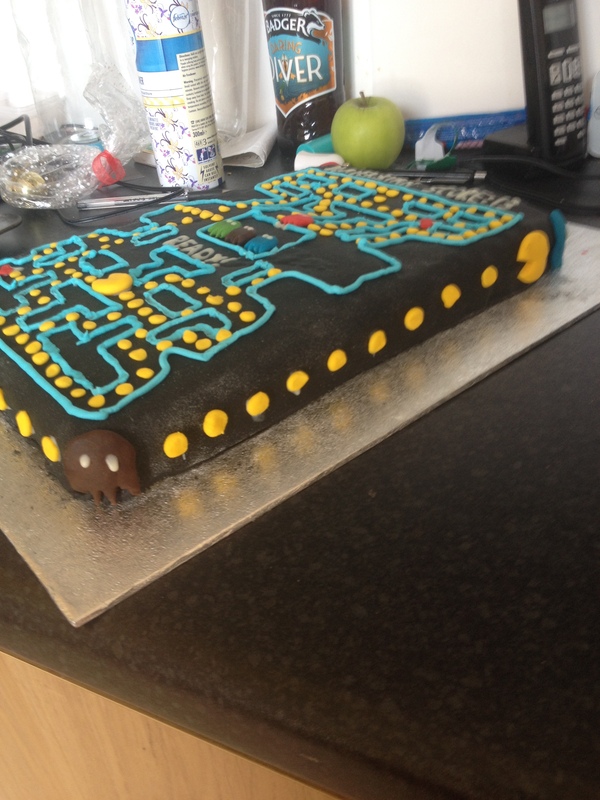 So I ended up with a chocolate cake, for a change, marzipanned and covered with blue fondant icing. The beach was made of shortbread, and the figures all made from coloured fondant as well. 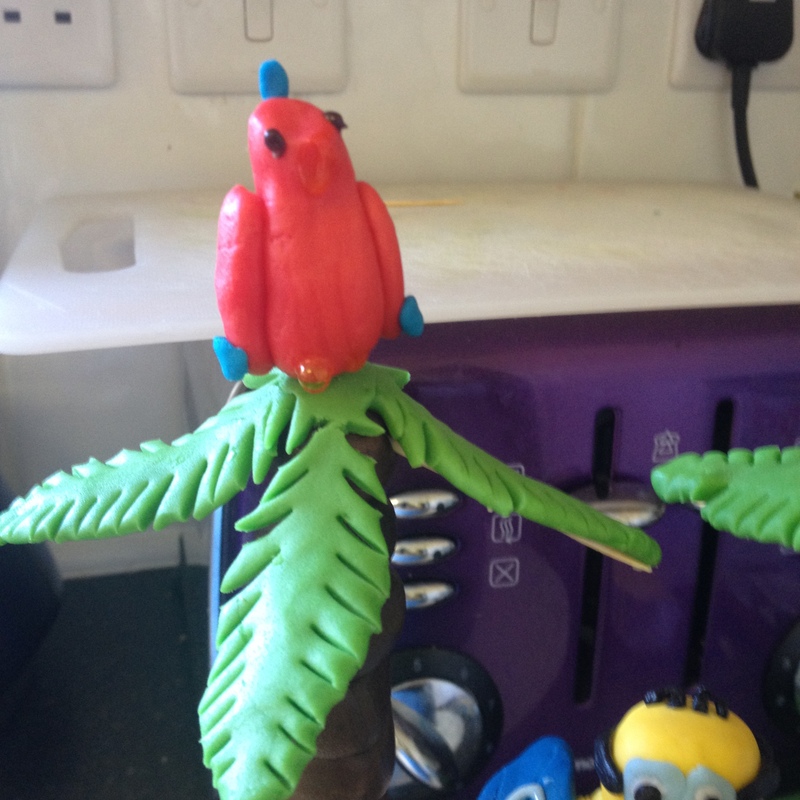 The palm trees were the most difficult part- I ended up making a sausage shape out of chocolate flavour fondant and cutting it into little pieces, then threading them onto a kebab skewer to make the trunk. I made the leaves out of green fondant and put them on top, then discovered they didn’t stay up very well, so made a frame of cocktail sticks that went underneath that they rested on, they were pretty fragile though! The kids thought it looked great, which was a bit touch and go after the car journey getting it to them! The next birthday was Ryan’s, just a week later. 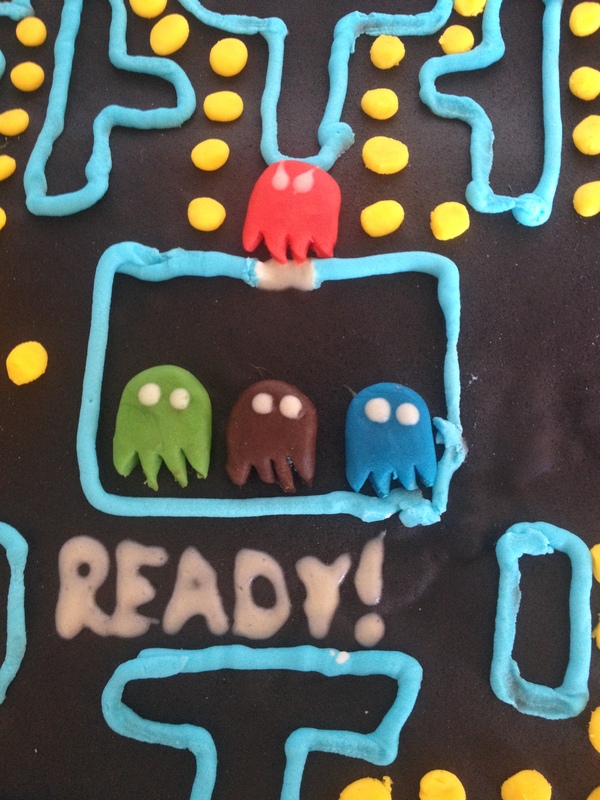 His party’s tend to be sleepovers and video games, so I kept with that theme and found a design for a retro space invaders cake. I’m not sure he ever played space invaders, being pretty technologically advanced, but he thought it was cool anyway. His ended up looking a bit like a slab initially, as it is a long flat cake, rather than the built up one the other 2 had. 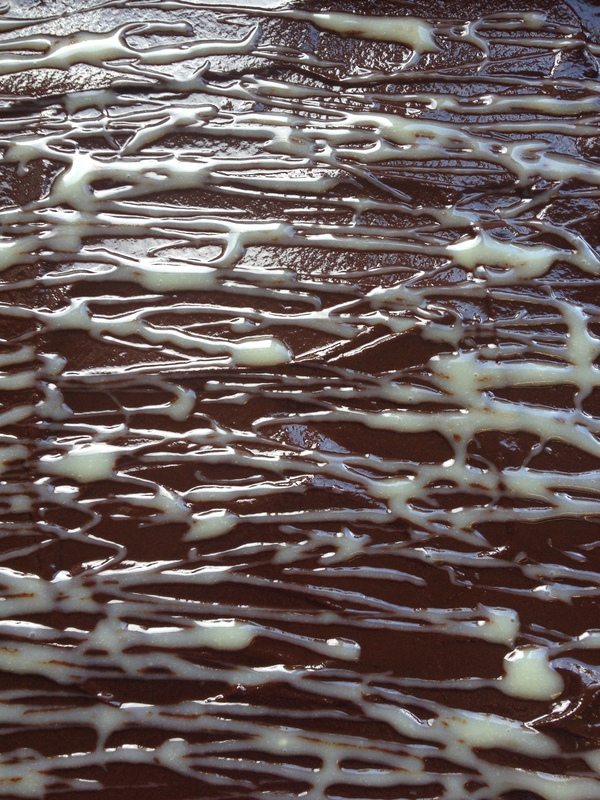 Black fondant icing wasn’t particularly appealing to work with, but it did the trick. After that there were some tiny fondant icing things to make, but the main effort was in piping. It took at least 2 hours and left me with a very sore hand, it was worth it in the end. albeit a little bit messy. Now that he’s getting a bit older, I think Ryan’s starting to lean towards flavour rather than design and has requested a cheesecake for next year, so that’s a new challenge! After the excitement of the birthdays was over I had to find another reason to bake, but fortunately we decided to run the Big Bake competition in church again this year, which is an event to support Tearfund’s No Child Taken campaign. We ended up raising £110 for Tearfund, and I got to do loads of baking and eating other people’s yummy cakes, so it was a win-win situation really. The event was split into three rounds to make it more challenging, and someone was eliminated at each round so by the final there were only 2 bakers left. The first round was the cake round, which is always interesting to see the huge variety of cakes, as that was the only guidelines we gave. We had a smarties pinata cake, caramel apple, chocolate, coffee and ferrero rocher (baked in, it was amazing), pineapple upside down cake, lemon curd cake, butterscotch and caramel and an amazing chess board cake. Fortunately they were spread over a few weeks, or it could have been a cake overload. 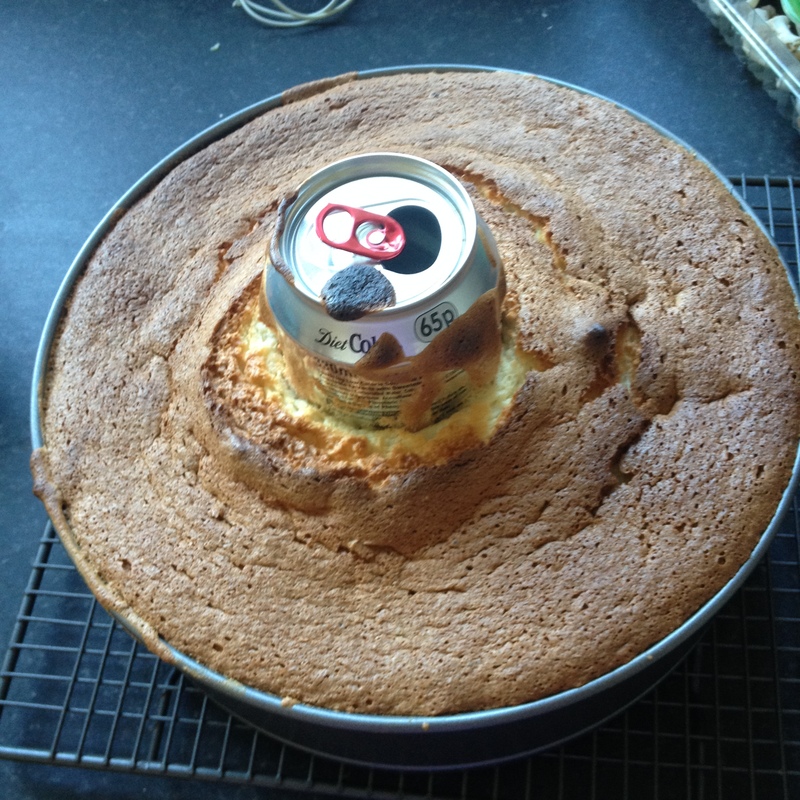 When it came to my turn I decided to make an angel food cake, which I’ve never made before but I wanted to take the opportunity to try something new. The recipe is Mary Berry’s from the Bake Off book from last year. It’s basically a very light cake with highly whisked egg whites, which you then fold the flour into very carefully, which gives it a fantastic consistency. I didn’t have a ring mould to make it in so I had to improvise, and found the recipe quite a fun one to follow, as the cake cools upside down! 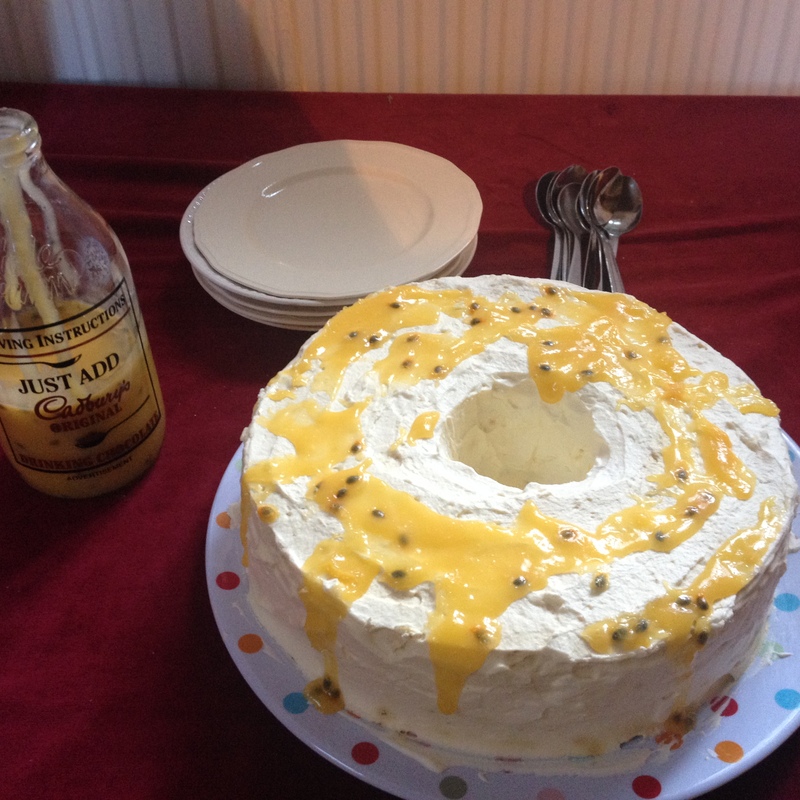 The icing was light and creamy, with a lemon curd and passion fruit coulis to go with it. 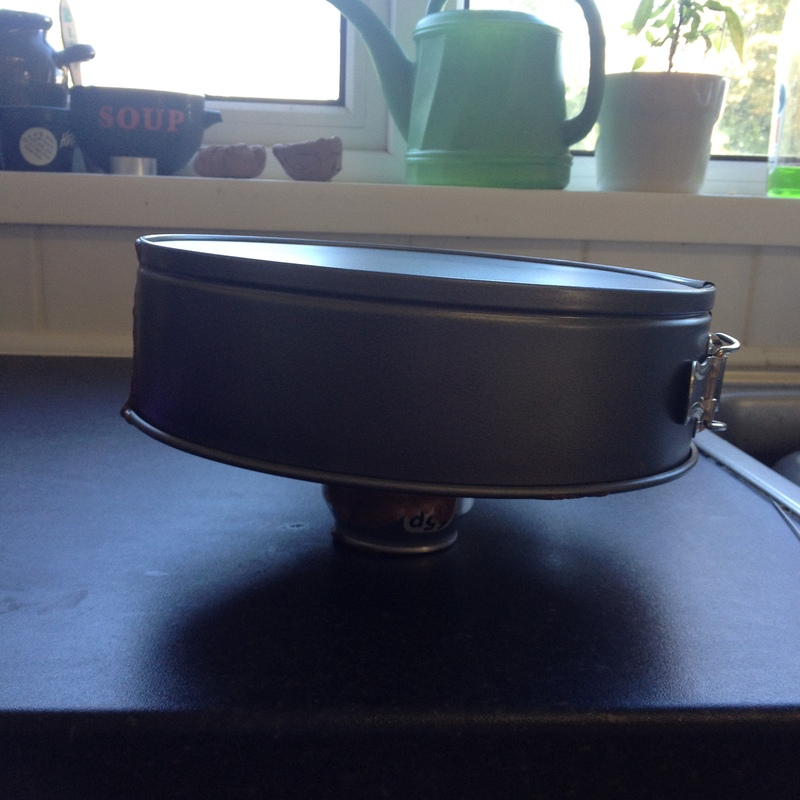 I was up against the coffee and ferrero rocher cake, and it was very tight, but I won! Phew! The next round was the biscuit round. 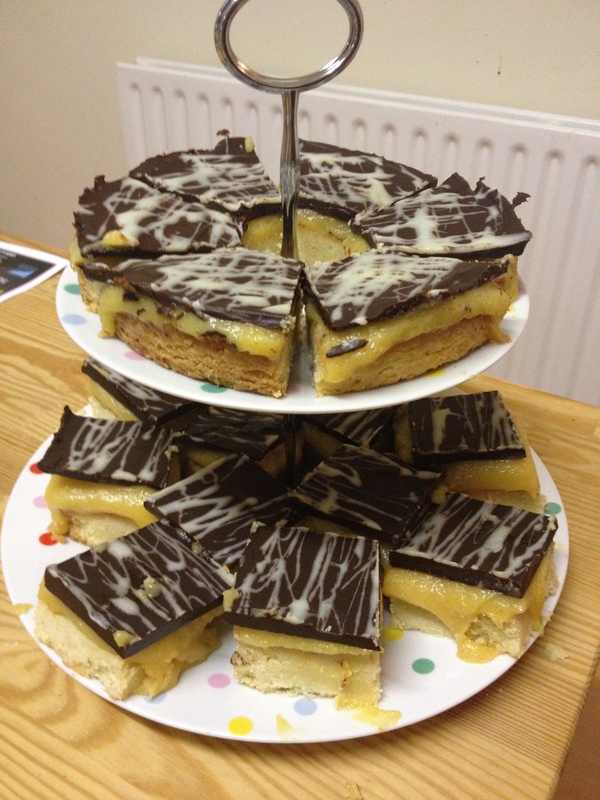 I made something I had made before this time, but that had a few stages- Millionaire shortbread. 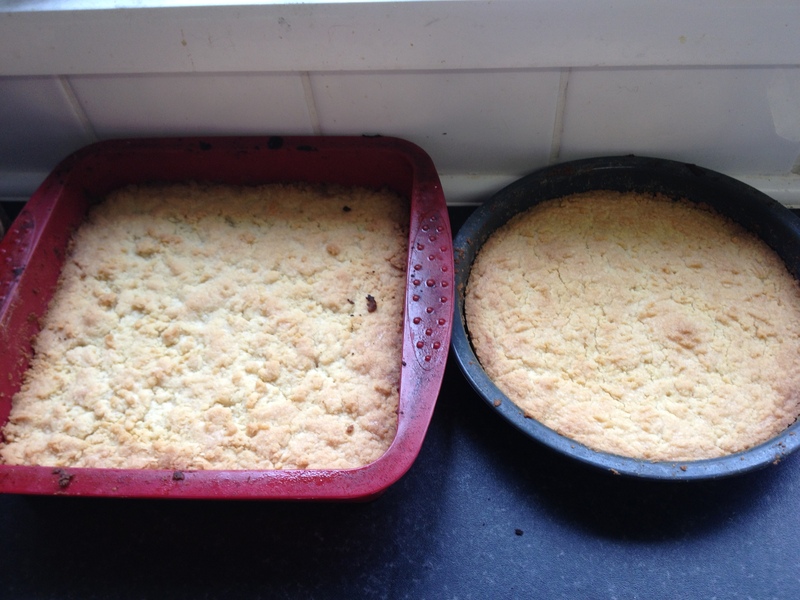 The shortbread is my favourite recipe, using cornflour and icing sugar to make it really light. 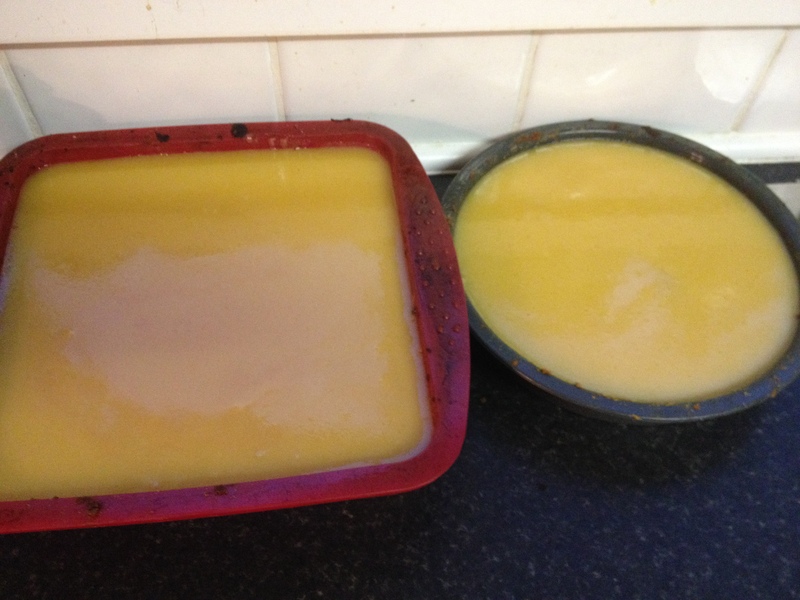 The caramel was one that used condensed milk and golden syrup, so was fairly straightforward but nerve-wracking working out whether you’ve got the right consistency. Then melted dark chocolate to top, and I did some white chocolate as well to make it look a little bit prettier. My opponent that week wasn’t as keen on making biscuits, so I made it through the semi final as well. The final then was the bread round, and I was against Eleanor, who is a very good baker, so I decided to make a very complex recipe, that I have made before but had help last time, to see if I could beat her. 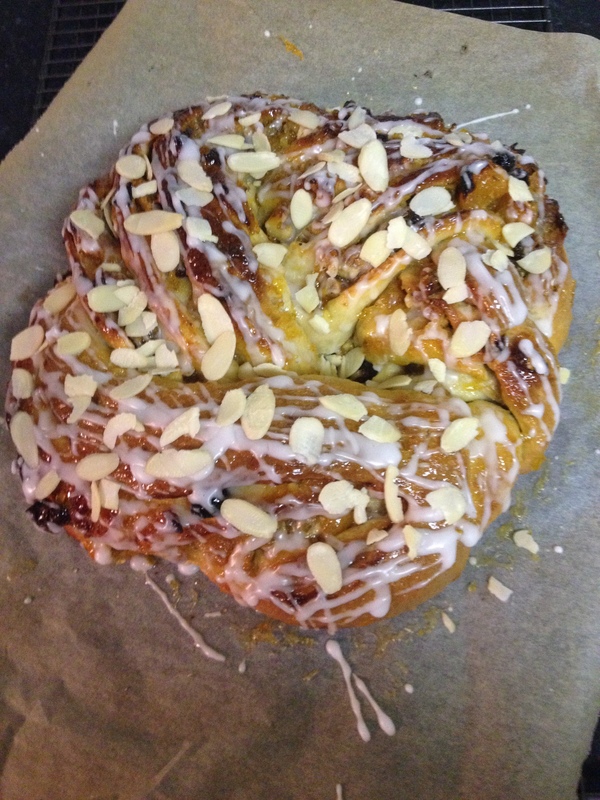 The recipe was an apricot couronne, which was a technical challenge in last year’s bake off. You have to make a dough and leave it to prove. While it’s proving you make a filling with butter, sugar, orange, walnuts, apricots and raisins, and then when the dough is ready you roll it out and spread the filling on it, then roll it into a long sausage shape. Then you have to cut it vertically down the middle and weave the sides together to make a crown. When you’ve got the shape you leave it to prove again before baking, then when it’s baked it’s glazed with apricot jam, drizzled with icing and scattered with flaked almonds. Eleanor had made savoury rolls, so it was a nice complement, but the recipe won out, and the couronne won. As a way of phasing out the baking rather than stopping straight away, I also made some apple and raisin crumble bars, and chocolate and orange muffins for a church bake sale raising money for the refugees, but didn’t get round to taking pictures of them. So, that’s the autumn baking update complete. I’m hoping to get some fundraising baking in at some point for the London Marathon and the Lullaby Trust, but at the moment I think my church are still full up! 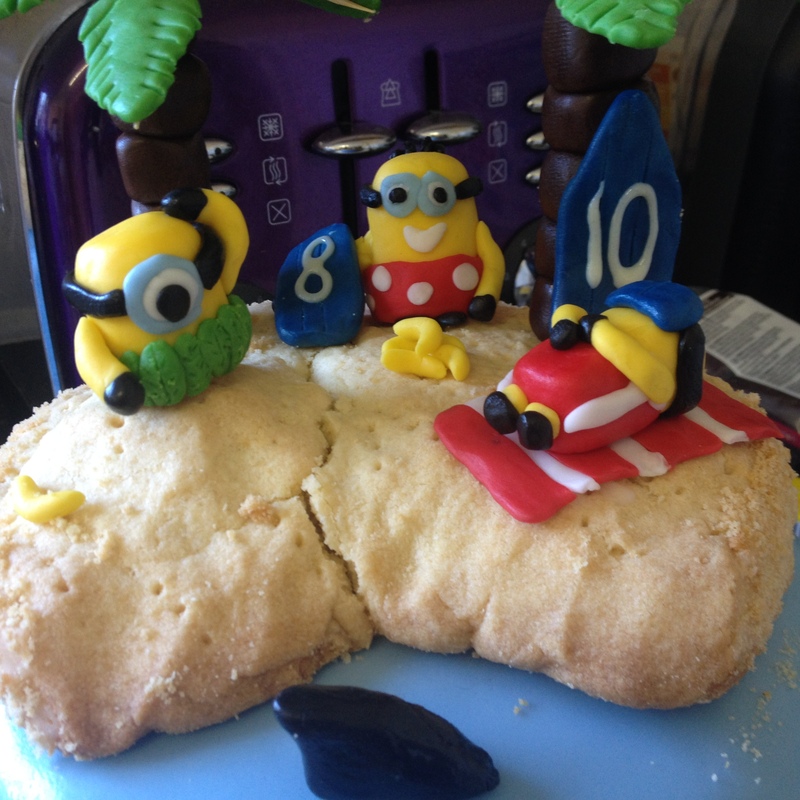 This entry was posted in Baking and tagged baking, birthday, bread, cake, minion, shortbread. Bookmark the permalink.